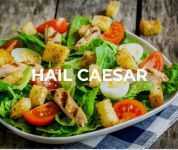 Romaine • Parmesan • Egg • Croutons • Black Olives • Caesar Dressing. Lindy's Subs & Salads in La Crosse. Turkey • Ham • Mozzarella • Carrots • Egg • Tomato • Dressing. 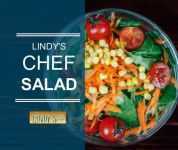 Lindy's Subs & Salads in La Crosse. Cucumbers • Broccoli • Cauliflower • Carrots • Tomato • Green Pepper • Mushrooms • Dressing. Lindy's Subs & Salads in La Crosse. Nacho Chips • Sour Cream • Salsa • Tomato • Black Olives • Cheddar. Lindy's Subs & Salads in La Crosse. 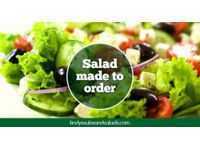 Feta Cheese • Tomato • Cucumber • Black Olive • Red Onion • Spinach • Dressing. Lindy's Subs & Salads in La Crosse. Chicken Strips • Salsa • Fat Free Sour Cream • Cheddar • Green Pepper • Tomato. 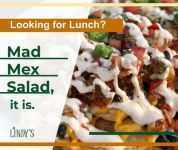 Lindy's Subs & Salads in La Crosse. Chicken Strips • Broccoli • Craisins • Carrots • Almonds • Dressing. Lindy's Subs & Salads in La Crosse. Chicken • Bacon • Chedder • Tomato • Ranch. Lindy's Subs & Salads in La Crosse. 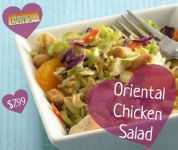 Teriyaki Chicken • Pea Pods • Mandarin Oranges • Carrots • Chow Mein Noodles • Dressing. Lindy's Subs & Salads in La Crosse. Iceberg or Romaine • Dressing • 8 pts. from Toppings List - 65 cents each additional point. 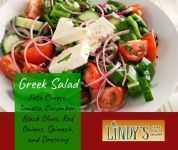 Lindy's Subs & Salads in La Crosse.